Reviews | Flavored Non-Dairy Powdered Creamer Shaker 12 oz. Flavored Non-Dairy Powdered Creamer Shaker 12 oz. The flavor is good, I prefer a creamer flavor I think it’s more milky then creamy but for this price it does well, I haven’t had any complaints by anyone so for me that’s what really matters. This flavored non dairy powdered creamer is so handy to have at my coffee bar. No need to spoon out your creamer just pour directly into you cup and grab a coffee stirrer. It has a nice flavor but not to strong. Very convenient. The absolute best prt about this creamer is that it is the powdered version and basically lasts about 4 times as long as the liquid version. A great, highly affordable solution for those of us who are lactose intolerant, but still want a creamy taste to our hot beverages. Easy to pour, easy to store. Works for me. Taste is as good as or better than the leading non-dairy creamer. Came packaged nicely as well. The top was taped shut and bubble wrapped. This is a great deal. One of the lower prices I have found for powdered creamer. Easy to set out for customers to put in their coffee. A wonderful, non-dairy product that dissolves quickly and doesn't offer a nasty after taste. It tastes very much plain and original, but offers great consistency in blending well. Non-dairy creamer at a better price. It tastes like the more expensive brands. Don't put it in very hot just that second made coffee, if possible, to avoid clumping. This is pretty decent but it does clump. Taste wise, it tastes just like other non dairy powdered creamers I've had. No complaints for me. We like to keep product like this on hand for when we run out of creamer, webstaurant has the best price, as always on this item. Flavored Non-Dairy Powdered Creamer Shaker 12 oz. is convenience and easy to use. Also it has a great flavor. i have have tired a lot of creamers before and this one is the best. The customers like this creamer also! Cant beat a good deal! Tastes just like the much more expensive national brand. Beware that it has the same textural issue - lots of clumping. I fill the cup 1/4 of the way, add the creamer, beat the tar out of it, then fill to the top. I rarely find clumps with this method. This non dairy creamer is perfect for our guests who have a lactose intolerance. It has all the same taste as regular milk, with out any dairy. This item is as described. The creamer was very smooth and creamy when mixed with the hot coffee. Would highly recommend this product for purchase. The Flavored Non-Dairy Powdered Creamer Shaker 12 oz. is a great buy for the price. We use this all the time for not only coffee, but also to make creamy curries. I'm lactose intolerant and look or dairy free options like this when I'm trying to cut out dairy. the creamer powder dissolves nicely in hot liquids but doesn't work well at all in cold beverages. A nice flavored non-dairy creamer. We have even dissolved this in warm water, chilled and put in a pitcher on tables for a nice substitute for cream when people ask for non dairy. We feel the liquid form is more pleasing than a powdered shaker container. We actually think the taste changes a little and gives a fine flavor to coffee.. 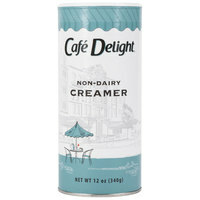 This 12 ounce flavored Non-Dairy Powdered Creamer Shaker was an easy and convenient way to transport and serve creamer. The canister was also very attractive. I haven't been thrilled with these. The ones I got had a blue label and didn't look like this one. They whole case is covered in a powder. I don't know if that's typical for these or not. Doubt I will buy again. Thank you for your review, Michelle. We are sorry that this creamer did not suit your preferences. Thank you for bringing this to our attention. We have updated the images to reflect the new manufacturer packaging. Great price compared to the name brands. Shelf stable so you can stock up. So much easier than buying creamer that you need to refrigerate. Can even be used in cooking. Dissolves well. We use it for our personal coffee maker. The flavor is not as rich as some from the grocery store but it gets the job done. These powdered creamer shakers are great for establishments that dont have space to store coffee condiments in a fridge! Great for travel as well! Nice price!!! This stuff is really good for office break rooms, or hospital waiting rooms. anywhere where there isnt going to be a refrigerator. really good price too. This is a very good coffee creamer, I keep it in the office area for employees. Not bad flavor, and it seems to last a very long time. Great price, very comparable to the expensive name brand creamers. Every year our homeschool group holds a Christmas craft day where the students get together and make crafts to give as presents. I have used this creamer in the cappuccino mix that they can make. The taste is very creamy and produces an excellent mix. The low prices help to heep the cost very economical. Since we no longer have a coffee vending machine, we now need to purchase creamer for our office coffee pot area. This was the least expensive after checking all my vendors. I bought these to use at work as well as a concession stand I run. They are just the right size, and priced better than I could get them from local coffee supply stores.